Visit to Kentucky—8 – Welcome to Cambodia, and….. Yesterday was a day for all the Dittmeiers and in-laws to get together and it was really neat. Today I was able to make contact with many friends from over the years. Unfortunately I wasn’t very active with my camera. 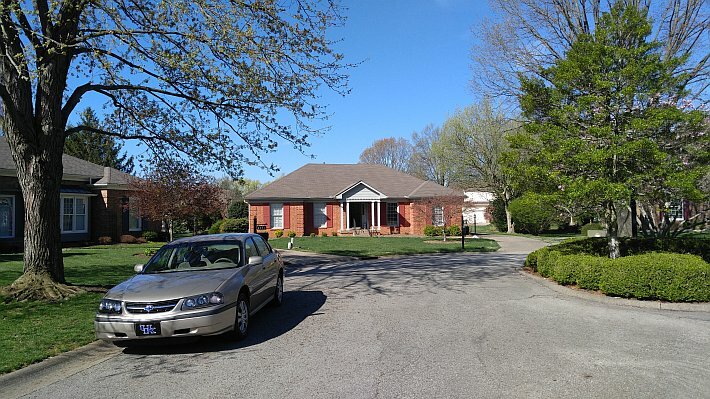 This was my home base during my stay in Louisville, my sister’s house. And the car, borrowed from another sister’s family, gave me mobility. • I went to St. Margaret Mary Church for their 8:15 mass this morning, hoping to see my cousins there but they didn’t make it today. • Next I went to see the Darcy family whom I have known and worked with since my college days. That was a delightful visit, as always! • Then I headed to Walmart and picked up some things to take back with me. • After lunch back at my sister’s house, I went to Sacred Heart Clifton for a visit with Fr. Jerry Timmel from whom I inherited the deaf work in the Louisville archdiocese. We were in the same priests support group for many years and Jerry has been a donor to the Deaf Development Programme. • From there I went to the Panera restaurant on Hurstbourne Lane and met with Charlie’s Angels, the four wonderful women whom I met through deaf work and Angela Merici High School. They are another group I try to see on every trip home.